Shark alley is a gully a short distance from the Cod Hole. 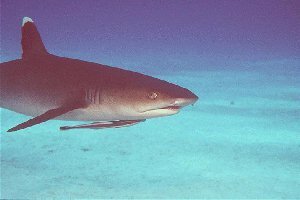 Shark alley is accessable from the cod hole dive site by swimming toward the outer edge of the reef. The dive site should only be accessed when the tide is comming in so that the current is against the divers at the beginning of the dive. This also avoids the risk of being swept around the corner of the reef into open ocean. To reach shark alley, begin swimming from the boat moored at the cod hole, and proceed to deeper water. It has been at this site that I have experienced some of my best diving to date. I have done about 15 dives at the Cod Hole and Shark Alley and one of them had an unexpected surprise for me and Belinda (Nimrod hostess). I was diving with Belinda during the cod feed. As I have seen several cod feeds, I decided to explore the nearby dive site of shark alley. Belinda had not seen that site before so it was settled. During the swim over to the site (past the feed area) I was surprised to find a medium size bronze whaler cruising in the deeper section of the alley. As we got closer we noticed that there was a grey whaler in addition to the bronze whaler. At this point I was happy about the dive as it had been almost two years since seeing a bronze whaler. Little did I know the dive was about to get better. After seeing the two sharks cruising in the alley, we noticed that all of the large cod and the large Maori wrasse was in the area also. The large cod and the Maori wrasse did not go to the feed. We were the only divers to see them. Then about halfway through the dive, I noticed that there were several white tip sharks together. I thought this would make a nice photo (three white tips close together). After I took the photograph, I notice that the larger of the sharks was female and one of the smaller (male) sharks had bitten the pectoral fin of the female and was holding on. At this point I realized that the white tip sharks were MATING! What luck! As I regained my composure, realizing I had a camera and madly dashing off to follow them, I turned around to motion to Belinda to follow. By this point she thinks I am crazy to chase off after the sharks. I got a few pictures and when she caught up the sharks had disappeared from sight and I had a chance to write on my slate "MATING WHITETIPS". At this point Belinda understood but did not know what she was in for. We waited for about 10 minutes for them to return without success. We started heading back for the boat when they appeared again. I started finning over in the direction of the spectacle and was fortunate enough to get one or two more shots. The action was hidden from Belinda's view by a bommie but she soon got an eye full. Just as she was able to catch up to me by the bommie, the female and four males cruise by (no pectoral grabbing at this point) and rounded the bommie within 6 feet of Belinda. Until this point Belinda had not been very close to sharks. I was busy clicking away as Belinda waited for fate. As the preoccupied white tips wandered off, Belinda heaved a sigh of relief and then indicated it was time to go. In all of the excitement, she had used up more air than either of us had anticipated (as did I) so now it really was time to go back to the boat. Fortunately, the current was in a favorable direction so we just drifted back to the boat. I spent the next 6 hours bouncing around the boat excited about having seen mating sharks (and hopefully) catching it on film. This is the type of unexpected things that pop up in shark alley. Some people have mentioned seeing manta rays (given the current flow from the Coral Sea, this is not a surprise, but I would like to find a manta ray here too), turtles, and a large school of sweetlips. This divesite is accessable from the Cod Hole, but beware of the strong currents. This dive should be done before the cod feed at the cod hole due to the depth. Work around to the deeper water to see the pelagics that frequent the area. Shark alley has a fish cleaning station located between two bommies. You may find some of the other potato cod being cleaned at this station. Other animals to see are the sea turtle in the alley, jacks and the usual white tip shark.. On occasion there are grey reef sharks in the area. Beware of the ever present currents in the area.